A handful of reinsurers have the power to hasten the phase-out of coal and play an important role in the fight against climate change but weak industry policies are undermining action taken by direct insurers, reveals a briefing from the Unfriend Coal campaign released today to coincide with a major industry conference. A growing number of major direct insurers, including AXA and Allianz, are backing international efforts to combat climate change by withdrawing cover and investment from coal projects, but the response from the reinsurance industry has been far weaker, finds Reinsuring Climate Chaos, which analyses the coal policies of five companies controlling nearly half the global reinsurance market. Reinsurers are increasingly important in allowing the coal sector to continue to expand. As major companies stop insuring coal smaller players will likely be approached to fill the gap. However, smaller companies will need higher levels of reinsurance to offset the legal, financial and natural risks of coal projects, which can run into billions of dollars. Without access to reinsurance, these companies may not be able to offer cover. “While the number of reinsurers active in the coal market can be counted on the fingers of two hands, it would only need the withdrawal of the biggest among them to challenge the expansion of the coal sector and hasten its phase-out,” states the briefing. It will be published during the 62ndRendez-Vous de Septembre, a global reinsurance conference in Monte Carlo where campaigners supporting Unfriend Coal will mount a protest to highlight the issue. The UN recently called for a stop to all new coal plants and an accelerated phase-out of existing plants as a key step to meeting the Paris climate target of limiting global warming below 2C and as close to 1.5C as possible. However, more than 630GW of new coal capacity is currently in planning or under construction. Swiss Re is the only reinsurer to take significant action on coal. It announced in July 2018 that it will no longer provide cover to companies and projects which rely on coal for more than 30% of their revenues or more than 30% of the power they generate. Swiss Re, Munich Re, Hannover Re, SCOR and Berkshire Hathaway are the world’s five biggest reinsurance companies , with a combined 44% of global premiums in 2016. The briefing paper reveals major limitations and loopholes in their policies on offering reinsurance to coal projects and companies. 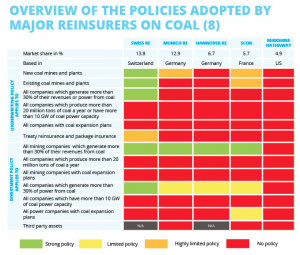 Swiss Re is the only reinsurer to restrict cover for all new and existing coal projects. SCOR rules out support for lignite projects but will continue to insure other existing coal facilities. Munich Re is not restricting cover for existing coal facilities. Munich Re’s CEO announced a new policy in a newspaper Op-Ed, but the company has yet to publish details. It must clarify how far the policy applies beyond industrialised countries, which account for less than 8% of new coal capacity planned or under construction. Swiss Re is the only reinsurer to restrict cover for coal companiesas well as coal projects.Munich Re and SCOR’s commitments only apply to contracts that cover a specific risk or defined package of risks, called facultative reinsurance; they do not apply to contracts where a reinsurer accepts all risk of a certain type from an insurance company, called treaty reinsurance. This loophole creates the risk that coal projects could continue to secure reinsurance by shifting from facultative to treaty contracts. Although Swiss Re says its policy applies across all business lines, it has not detailed how it applies to treaty reinsurance. No reinsurer currently restricts cover based on the absolute scale and development plans of companies’ coal activities. Even Swiss Re’s 30% exclusion threshold still allows big diversified companies and new coal developers to slip through the net. Hannover Re, Berkhire Hathaway and other major reinsurers continue to underwrite coal companies and projects with no restriction. However, Hannover Re, unlike Berkshire Hathaway, has joined Swiss Re, SCOR and Munich Re in divesting from coal. The Unfriend Coal campaign calls on reinsurers to cease providing reinsurance support for all new and existing coal projects globally as well as for companies developing new coal projects, depending on coal for more than 30% of their business, producing more than 20 million tonnes of coal a year or operating more than 10GW of coal power. It also calls on reinsurers to divest their assets from companies covered by these criteria. Campaigners are due to underline their demands with a protest in Monte Carlo harbour during the Monaco government’s cocktail party for reinsurers on September 10th. Reinsurers are starting their annual contract negotiations with insurers in Monte Carlo, and campaingers will call on them not to renew coal insurance contracts. Unfriend Coal has called on reinsurers and insurers not to underwrite the proposed 1,000 MW Ostroleka C coal plant in Poland, identifying it as a test case of their commitment to action on climate change. If built, the plant would operate from 2023 until 2063, far beyond the timeline for phasing out coal in line with the Paris Agreement. In addition to its devastating climate impacts, public health campaigners have warned that pollution from the plant could cause between 900 and 2,000 premature deaths.